Who needs a reason to have a chocolate milkshake? Well, if you do – today is it! 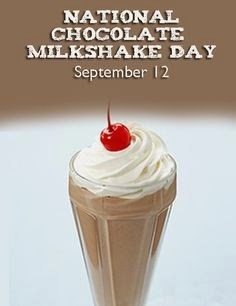 It’s National Chocolate Milkshake Day – September 12th! 1. Place ice cream, milk, syrup and cherries in blender container. Cover; blend until smooth. 2. Garnish with whipped topping and cherry, if desired. Two 10-oz. servings. Need a new or better blender? Why not invest in a VitaMix – you can grab one on QVC right now for $439 or 5 monthly payments on Easy Pay of $87.80, plus Tax. Shipping is FREE! Quick Devil’s Food Cake with Peanut Butter Broiled Topping! One of my dear friends Devon Warren, from Fort Worth, Texas invited me over one night and we made this heavenly dessert, I could not believe how incredibly easy and delicious this cake was! This has to be hands down my favorite cake recipe ever!! She has graciously given me her blessing to share this wonderful dessert with you. The nice thing about this recipe is that there is very little clean-up! Make this for your family tonight and I promise you will not be disappointed! Preheat oven to 350 degrees. Mix wet ingredients together in an 8×8 square baking dish. Then, sift dry ingredients together and pour into baking dish. Mix all ingredients together very well using a fork. Scrape sides often to make sure it’s incorporated. Mix ingredients together, then spread mixture evenly on warm cake. Set oven control to broil or 450 degrees. Place cake about 5 to 6 inches from heat and broil about 1 minute or until it bubbles and slightly browns. If you want to make this into a 9X13, just double the recipe (a chocolate cake mix would work just as well). You are going to LOVE this recipe!!! Frugal Friday: Homemade Nut Butter–It’s SO EASY! Did you know it really only takes 1 ingredient to make nut butter? Yes all you need is NUTS! First off, place your nuts of choice in a food processor (you can toast your nuts first for about 15 minutes if you want a roasted taste), we used 1/2 cup raw almonds. Pulse the nuts to a powder consistency. Then, run your food processor for a few minutes. Allow the nuts to relax for a minute or two, then run your processor again. You will notice the mixture will start clumping up. Continue to repeat the process until you get a smooth nut butter consistency! From start to finish it took about 10 minutes. Now you can add honey to sweeten, a pinch or salt, or enjoy by itself! You just made your own nut butter!!! Mix all ingredients together in a bowl (I did lightly pulse chocolate chips first), then cool mixture in refrigerator for at least 1 hour or overnight. This helps soften the oats and makes the mixture easier to form. Then roll mixture into balls and your ready to serve. Store in refrigerator for snacking to help give you a boost of energy! Ice Cream Cake Using Ice Cream Sandwiches! Great Summer Treat! Place candy pieces in plastic bag and strike with heavy spoon to coarsely chop. Arrange 4 ice cream sandwiches long sides touching on a flat serving plate. Squirt an even layer of whipped cream over top, making sure whipped cream extends to outside edges for best appearance. Repeat layers twice. Garnish top as desired. Vary candy colors and choices to represent holidays or special occasions throughout the year. Use birthday candles with holders for a special birthday cake. Use two layers of two sandwiches each, and let kids assemble their own creations. Looking For An EASY Dessert For Memorial Day BBQ’s?!? Check This Out! Take a good ol’ mini ice cream sandwich, put a popsicle stick on one end, and coat the ice cream in patriotic sprinkles! LOVE because it’s easy, affordable, and I don’t know anyone that doesn’t like these little bites of goodness! *A typical store brand box of ice cream sandwiches costs between $2.00 and $4.00! I know Walmart’s Great Value is $2.98 for 12pk, and they carry 97% fat free ice cream, sugar-free, and different flavors too. Enjoy! ***If you can’t find the mini ice cream sandwiches, no worries just buy the regular size and cut them in half.